A veteran singer makes a grand return and some new names show up for the first time on OH! Chart. Rapper Woody debuts his new song Fire Up on the OH! Chart this week, earning the week’s highest digital score with 49,517,597 points. Second place in the digital category is none other than MC The Max‘s After You’ve Gone, with 43,044,817 points. After first appearing on the OH! Chart in 2019 Week 02 and keeping a stable rank ever since, this marks the song’s fifth consecutive week in the digital category’s top two. Lastly, Lee Sora‘s Song Request, which features BTS‘ Suga, ranks third digitally with 39,313,281 points. Seventeen are Hanteo’s highest physical sellers for the second week in a row, selling 33,233 copies of their mini-album You Made My Dawn. Next up, in second place is 2PM member Junho, with his best-of album TWO selling 10,714 units in its first week on the OH! Chart. Rounding out top three is BTOB member Minhyuk, under the stage name HUTA, with his solo debut album HUTAZONE. This is HUTA‘s third week of consistent sales on the OH! Chart, selling 9,222 units. Voting this week is, unsurprisingly, led by GFriend, with 26 buddies lending their votes to Sunrise. GFriend has remained top two in the voting category since Sunrise‘s chart debut in 2019 Week 04. Next, in second place is Lee Sora and Suga with Song Request, receiving 17 votes, which was also second last week. Rounding out the top is, Seventeen earning the third highest vote count, trailing only slightly behind as Home was voted for by 15 users. Amazingly, this week’s voting category top three is identical to last weeks. Lee Sora earns her first OH! 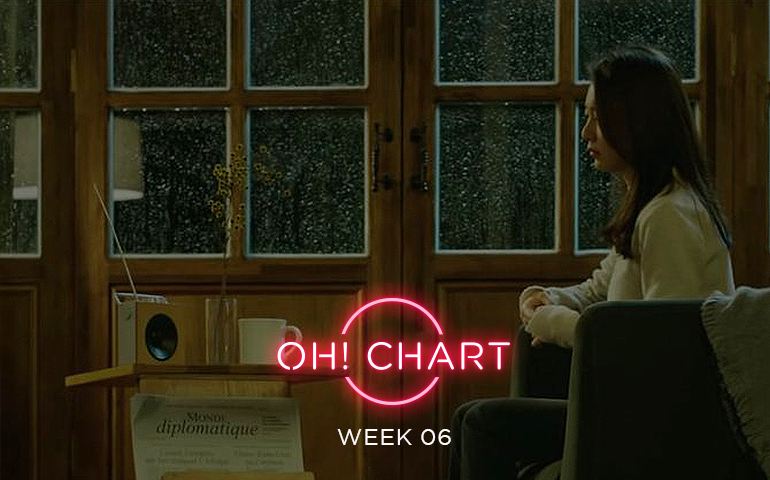 Chart trophy this week, as Song Request‘s strong presence in the digital market and high amount of support from OneHallyu combine into Week 06’s highest score. The second-week slump in album sales is all too real as Seventeen experiences an 87% decline in sales with Home, but the boys prove their strength as they secure second place. Lastly, Woody debuts on the OH! Chart in third place with Fire Up. Veteran singer Lee Sora has released her first song of 2019 – Song Request – and it’s already proving to be a hit. With songwriting from Epik High’s Tablo and a featured verse from BTS’s Suga, fans of both rap and ballad music can enjoy this unexpected crossover. Will she continue to dominate or will OH! Chart see some stiff competition next week? Stay tuned to find out!